Today is Bengali New Year নববর্ষ ১৪২১, a special day which is very close to all of our heart. I remember in my childhood days we three sisters used to wear a new dress to celebrate the special day. Our morning used to start with new dress then lots of good food. Bengalis are always known as a foodie and that’s why we don’t leave any special day to celebrate with lots of authentic foods. And I don’t think without a special bowl of Mutton Curry or KACHI PATHAR JHOL any Bengali occasion complete. 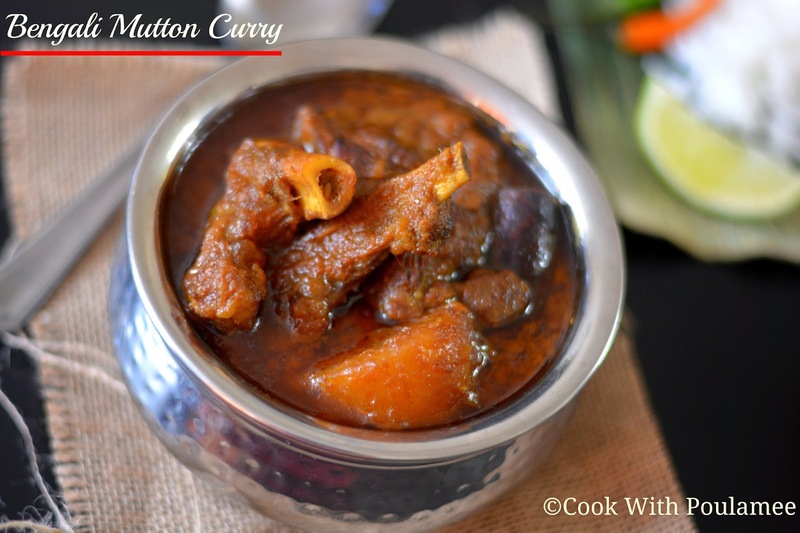 This year for the very first time I prepared some BENGALI MUTTON CURRY in my maa’s style. I learnt the entire authentic recipe from my maa only. 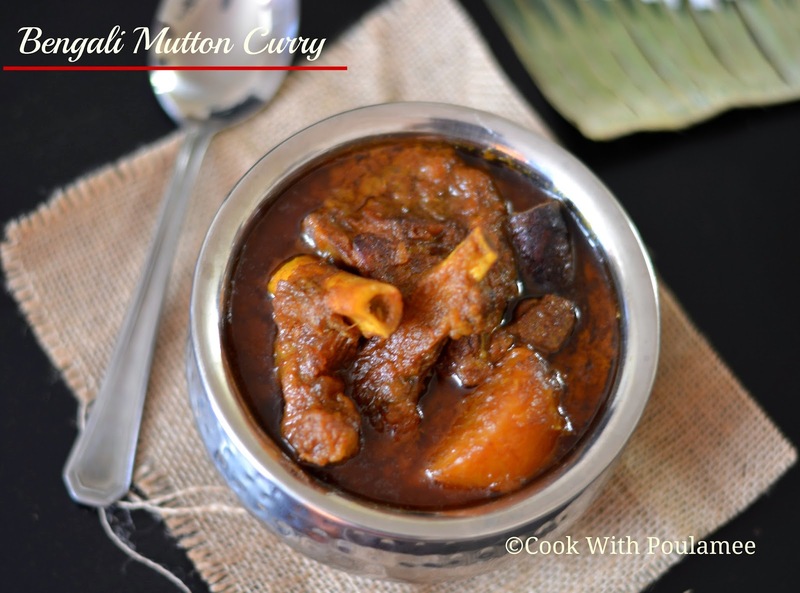 This mutton curry is a very common dish for all Bengali or I can say a must desire for all Bengalis Sunday lunch menu. My maa used to cook this in pressure cooker but I cooked in a Karai but to make it soft I cooked for almost 1 ½ hours. With plain rice this dish will make us very happy. 4.6 to 7 clove garlic. 8.Two to three potatoes cut into halves. 9.Turmeric powder: ½ tea spoon. 10.Red chili powder: ½ tea spoon. 11.Garam Masal Powder: ½ tea spoon. 12.Whole garam Masala: 1 bay leave, few clove, 1 black cardamom, 1 dry red chili, 1 small cinnamon stick. 13.Salt and sugar as per taste. 14.Dry curd: 1 table spoon. First make a smooth paste with the ginger, garlic and green chilies. 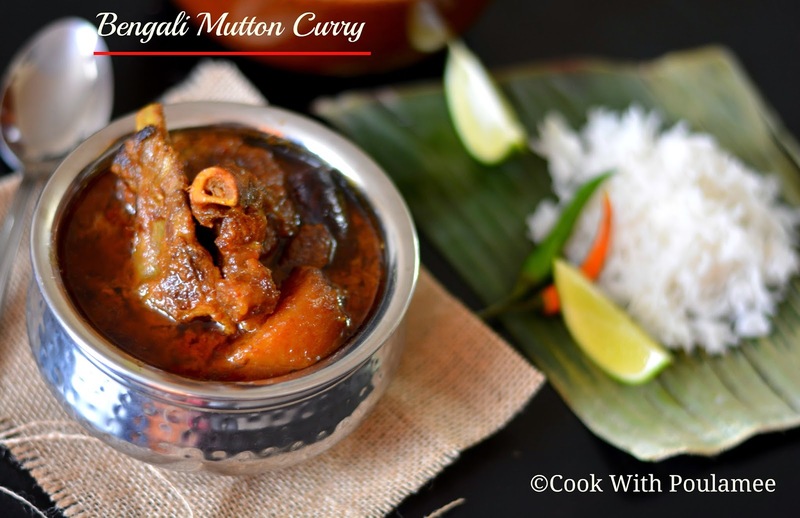 Now wash and clean the mutton pieces, now marinate them with salt, vinegar, curd, half of the ginger garlic and green chili paste and one table spoon of mustard oil and mix well. Now keep it in refrigerator for 30 mints. Now add some oil in a karai and fry the potato pieces till they turn golden brown and keep it aside. Now on the same vessel add all the whole garam masala and wait till the aroma comes out, now add some sugar and the sliced onions and fry till they turn golden brown. Next add the onion paste and rest of the ginger garlic and green chili paste and mix well. Now add the turmeric powder, red chili powder and some salt and cook till the masala start leaving oil. Now add the marinated mutton and mix well, and cook with a cover for 15 mints. Now remove the heat and add the fried potato pieces and cook in low flame with a lid for another 15 mints just check in between. After that you can put all the curry in a cooker with two cup of hot water and cook till 4 whistle. But I cooked in the karai only so after that I add one cup of hot water and cook in medium heat for 40 to 45 mints. Just add the garam masala powder in between and check that you need to add more salt or not. 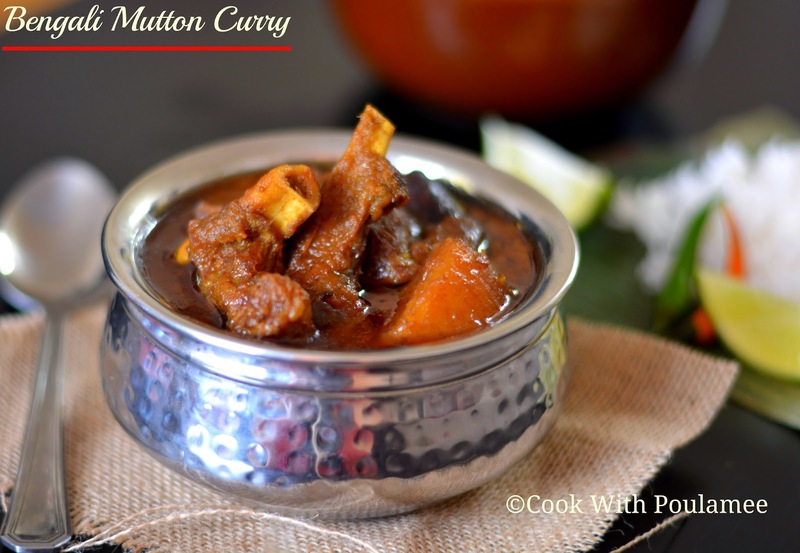 Now remove from the heat, the blackish little reddish little oily my favorite mutton curry is ready serve hot with plain rice. Note:(if you are not going to cook the curry in the cooker then after 15- 20 mints just take out the potato pieces from the gravy otherwise they will melt. just add them again before switch of the flame).